At $85.95, LUSH's Gorgeous Facial Moisturizer is definitely on the pricier end of the Lush products spectrum, but gosh, what a moisturizer. The star ingredient is organic orange blossom honey which, like honey in general, has antiseptic and moisturizing benefits. The rest of the ingredients list is also chock full of natural goodness. Hydration all-stars like organic extra virgin olive oil, cold-pressed avocado oil, and extra virgin coconut oil combine with a slew of citrus juices and oils that tone and brighten. This moisturizer is formulated to be suitable for all skin types. 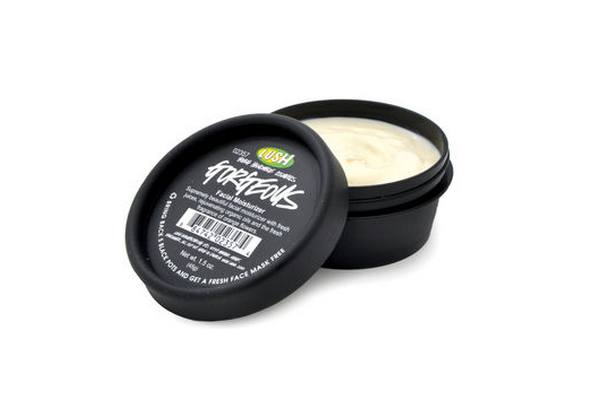 The consistency is surprisingly light and non-greasy and absorbs quickly, and considering this is a LUSH product, the fragrance is barely there. If I had one criticism for the formula, it'd be that it absorbs a little too quickly. Earlier in my product testing, conscious of the price tag and the "A little goes a long way" instructions on the packaging, I didn't apply nearly enough for my dry skin which drank it up like water. Put on half a teaspoon's worth if your skin is very dry, less if you have normal, combination, or oily skin. If your complexion tends to drink up moisturizers like water, the price tag on this might be a bit steep. But if you need a quality natural moisturizer and are willing to pay for it, this one is a contender. This is by far my favorite product from Lush. I am obsessed with the smell. I would pay that much just to use it as a perfume on my neck. Love love love.